The fall equinox means the end of summer for the Northern Hemisphere, but marks the beginning of spring — and the first glimpse of the sun since March — for scientists at NOAA’s South Pole Atmospheric Baseline Observatory located at the Amundsen-Scott South Pole Research Station. As hints of spring appear across the United States, NOAA’s first all-women crew at the South Pole atmospheric observatory are half a world away, ready for Antarctica’s brutal, six-month polar night. The fall equinox signals the coming of winter for the Northern Hemisphere, but heralds the arrival of spring — and the first sunrise since March — for researchers at NOAA’s South Pole Atmospheric Baseline Observatory. As winter closes in, flights to the international research compound are suspended for the long Antarctic winter. The hole in the Earth’s ozone layer that forms over Antarctica each September grew to about 8.9 million square miles in 2016 before starting to recover, according to scientists from NASA and the National Oceanic and Atmospheric Administration (NOAA) who monitor the annual phenomenon. To mark the peak of ozone hole season, we’re highlighting four ways that climate and the ozone hole are related—and one important way they aren’t. In the Northern Hemisphere, the spring equinox promises warmer days and green plants. But for researchers at NOAA's South Pole Atmospheric Baseline Observatory, Sunday March 20 marks the start of the austral autumn, the last time they see the sun for six months. 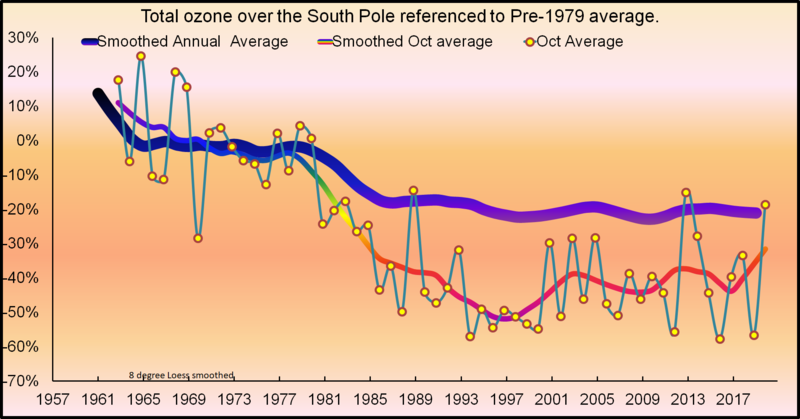 NOAA’s measurements of ozone at South Pole registered a record low for the month of October. This year, the average amount of ozone measured by a Dobson instrument at South Pole in the second half of October was 114 Dobson Units (DU), or 60 percent below the pre-ozone hole conditions. The sun rises at the South Pole every Sept 21, after six months of darkness, and the spark of light from the rising sun also starts a season of ozone depletion down south. With the approach of that date in mind, a CIRES/NOAA scientist and videographer has developed a short, educational video that focuses on the ozone research being conducted by NOAA and CIRES scientists. 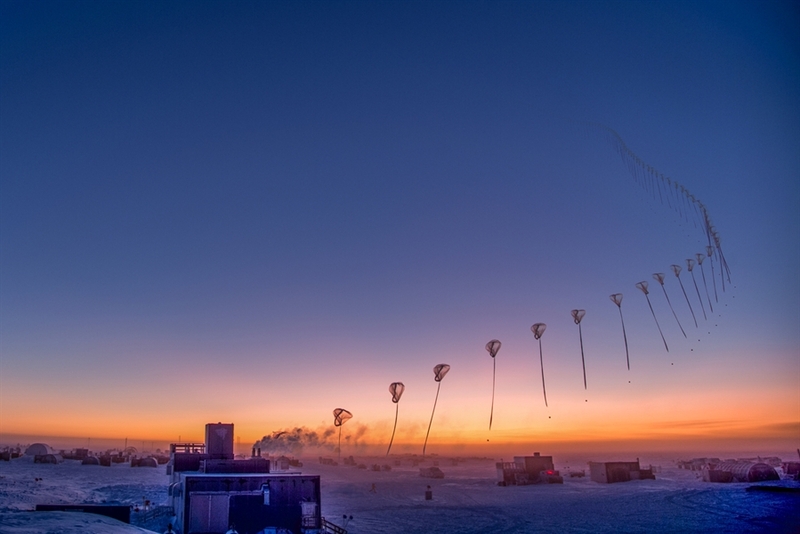 For nearly 50 years, scientists with NOAA have launched high-altitude balloons from the South Pole, to understand why a hole was forming in the protective ozone layer high in the atmosphere. 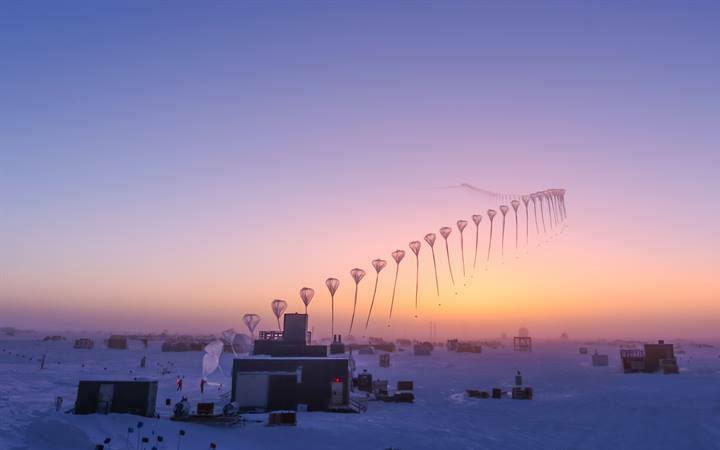 Now, organizations around the world track the infamous ozone hole through these ballon-sondes, satellite measurements and ground instruments. At the bottom of the world, fifty people are looking forward to seeing the sun peek above the horizon on or around September 22 – the first time they have seen the sun in six months. NOAA ESRL/ GMD personnel LTJG Heather Moe and Johan Booth spent the Antarctic winter working at NOAA’s Atmospheric Research Observatory located at the geographic South Pole. The Amundsen-Scott South Pole Station, one of three United States research stations in Antarctica, only experiences one sunrise and sunset per year due to its location at 90˚S latitude. The Antarctic ozone hole, which yawns wide every Southern Hemisphere spring, reached its annual peak on September 12, stretching 10.05 million square miles, the ninth largest on record. Above the South Pole, the ozone hole reached its deepest point of the season on October 9 when total ozone readings dropped to 102 Dobson units, tied for the 10th lowest in the 26-year record. 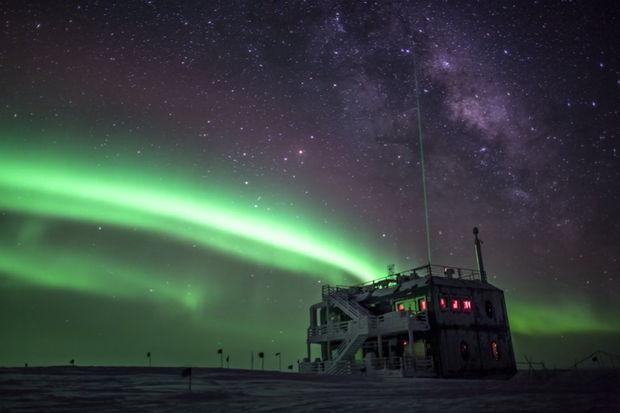 Scientists from NOAA Earth System Research Laboratory (ESRL), Global Monitoring Division, are closely watching the development of the Antarctic ozone hole from the South Pole observatory.